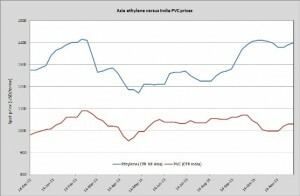 Import PVC prices for January were announced with increases in Asia as per the pricing service of ChemOrbis. Sellers pointed to supply limitations and strong upstream costs as justifications for their price hikes. Buyers expressed some surprise at the extent of sellers’ increase targets, although most conceded that January deals would settle higher than December. A trader based in Shanghai reported receiving offers from a major Taiwanese producer with a $20/ton increase. “We had been expecting a $10/ton increase at most, but our supplier is insisting on a $20/ton hike, claiming that demand for Asian cargoes will be better in January as American producers will scale back their export allocations,” the trader commented. Another trader who received Taiwanese prices at the same levels also said that their supplier was standing firm on their prices, saying that the producer felt confident that their new prices would eventually be accepted by the market. A PVC film manufacturer in China said that they received January prices with $20/ton hikes for Taiwanese origins and $30/ton increases for American cargoes. “We were surprised by these increases as we had been expecting to see rollovers. We plan to delay our purchases for now as we believe that these new prices will meet resistance from buyers,” the converter reported. A trader in Thailand said that they expect to see $10-20/ton increases from their Chinese supplier, commenting that they do not believe that any larger increases will not prove workable in the market. Local prices in Southeast Asia also moved higher for the coming month. “We resumed our production last week following a maintenance shutdown and are still struggling to catch up with our back orders. We are standing firm on our prices for December and are planning to lift our prices for January based on stronger VCM costs and the recent depreciation of the peso against the dollar,” a source at a Philippine producer stated. An Indonesian producer raised their prices to the local market by $20/ton. “We have reduced our operating rates to around 50-60% as VCM supply is limited and feedstock costs are high. We believe that prices will see further increases as supply is dwindling. We are seeing good demand from pipe manufacturers although demand from cable manufacturers is not doing so well,” a producer source reported. A converter in Indonesia also reported seeing $20/ton increases in domestic pricing. “Our margins are suffering as we have not been able to raise our end product prices sufficiently to make up for the rise in our raw material costs occasioned by the depreciation of the rupiah against the dollar,” the buyer commented. According to ChemOrbis, an ethylene based PVC manufacturer in China said that they raised their local prices by CNY50/ton ($8/ton). 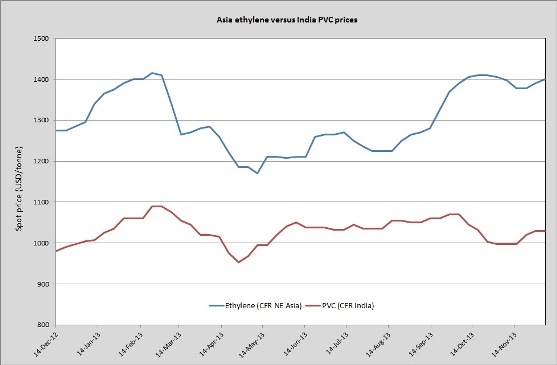 “Availability of ethylene based PVC is tightening as several producers in the east of the country are struggling to receive adequate feedstock supplies,” a producer source reported. Another ethylene based producer said that they have cut back on their offers in response to dwindling feedstock availability. “We are only working with our existing customers now as we do not have enough supply to make offers to new customers,” a producer source said.